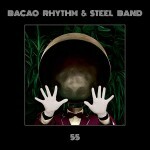 Full length album my Mocambo’s Bacao Rhythm & Steel Band project. Keeping in the tradition of Steel Drum records, 55 is a journey through re-interpolations and covers with an updated approach, pushing Steel Pan music to uncharted territory. Flawlessly bringing previously untouched genres into the steel pan cannon ranging from Underground Hip Hop tunes to staple Funk tracks and some of all that falls in between. From the smoothed out Reggae cover of John Holt’s “Police In Helicopter” to the DJ sure shot cover of Faith Evan’s “Love Like This” BRSB’s 55 is reinvigorating tunes both well known and helping to shed some light on tunes still largely undiscovered. However, some of the strongest tunes on the album are original compositions, from spaced out Disco vibes on “Beetham Highway Ride” and “Port Of Spain Hustle” to the ugly face inspiring drums of “Laventille Road March”. Recorded to analog 8 track tape at The Mocambo Studios in Hamburg, 55 is a gritty, punchy journey in sound drawing on music from around the world, using production aesthetics from across both eras and genres, all coming together seamlessly. If the 45s that have already come out on Mocambo, Plane Jane, and Truth & Soul are an indication, this full length is going to be a staple to both casual listeners and Disc Jockeys alike.